In case you’ve ever wondered why anyone would become a scholar and spend life mired in musty, dark library stacks, let me introduce you to an assistant professor of English at Montclair State University in New Jersey. “In an unassuming notebook held in an archive at the University of Cambridge,” writes Jennifer Schuessler at the NY Times, “an American scholar has found what he says is an important new clue to the earthly processes behind that masterpiece [the King James Bible]: the earliest known draft, and the only one definitively written in the hand of one of the roughly four dozen translators who worked on it. “The notebook, which dates from 1604 to 1608, was discovered by Jeffrey Alan Miller, an assistant professor of English at Montclair State University in New Jersey, … last fall, when he was in the archives at Sidney Sussex College in Cambridge, researching an essay about Samuel Ward, one of the King James translators and, later, the college’s master. He was hoping to find an unknown letter, which he did. “ ‘I thought that would be my great discovery,’ he recalled. “But he also came across an unassuming notebook about the size of a modern paperback, wrapped in a stained piece of waste vellum and filled with some 70 pages of Ward’s nearly indecipherable handwriting. “The notebook had been cataloged in the 1980s as a ‘verse-by-verse biblical commentary’ with ‘Greek word studies, and some Hebrew notes.’ But as Professor Miller tried to puzzle out which passages of the Bible it concerned, he realized what it was: a draft of parts of the King James Version of the Apocrypha, a disputed section of the Bible that is left out of many editions, particularly in the United States. ” ‘There was a kind of thunderstruck, leap-out-of-bathtub moment,’ Professor Miller said. ‘But then comes the more laborious process of making sure you are 100 percent correct.’ ” More here. 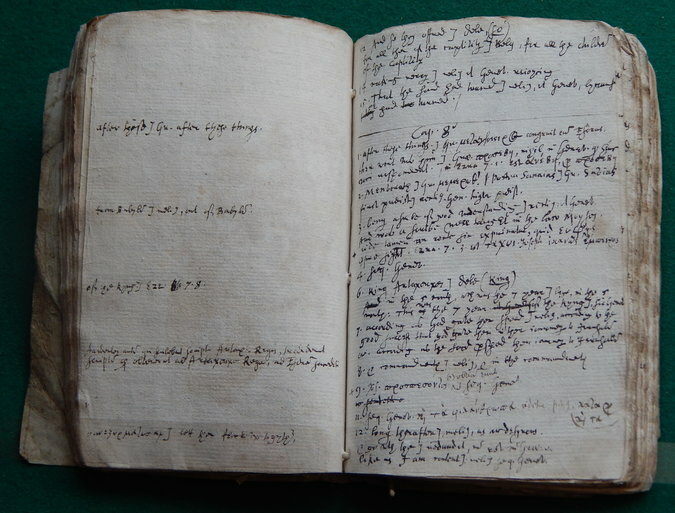 Pages from Samuel Ward’s translation for part of the King James Bible, the earliest known draft for the King James translation, which appeared in 1611. I have always understood the appeal of being a professor but this, THIS, is stupendous! Every academic’s dream . . .
A thriller like “The DaVinci Code,” only literate.